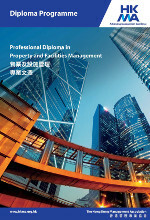 With the increasing demand for property and facilities management professionals, the Association has introduced this Property & Facilities diploma course to focus on the tools and techniques of professionalism required by Housing/Property/Facilities Managers and Executives. This Property & Facilities diploma course can be completed in ten months. It consists of seven modules, with a diploma being awarded upon successful completion of the course. Applicants who have completed equivalent modules in the programmes offered by HKMA or other institutions may apply for exemptions for up to 2 modules. The programme commences in February and August each year, and the application deadline is normally one week prior to the commencement date.